Using self-massage to relieve tension and promote relaxation. In an age when we must all be concerned about healthcare costs and the changing face of insurance coverage, responsibility for own health and wellness is more important now than ever before. While there are certainly many healthcare issues that require professional intervention, there are many things we can do at home to take care of ourselves, and recently I have found a physical therapy tool that my therapist turned me on to and now I use daily to maintain the progress I made in therapy sessions. Everyone likes a massage, and while the idea of a self-massage might seem confusing, and growing number of tools are available for just that. The most common of these are foam rollers, which can be used for a variety of applications that can release muscle tension, stretch tense areas and rub out sore spots. Granted, manipulating your body on a foam roller is not as passive as laying on a table while a therapist works their magic on you, but it also gives you a sense of control over what muscles need the most work and how much pressure to apply. A company named OPTP makes a wide variety of these rollers. They have rollers of different density and firmness, different textures, sizes, links, and even an assortment of colors and patterns. 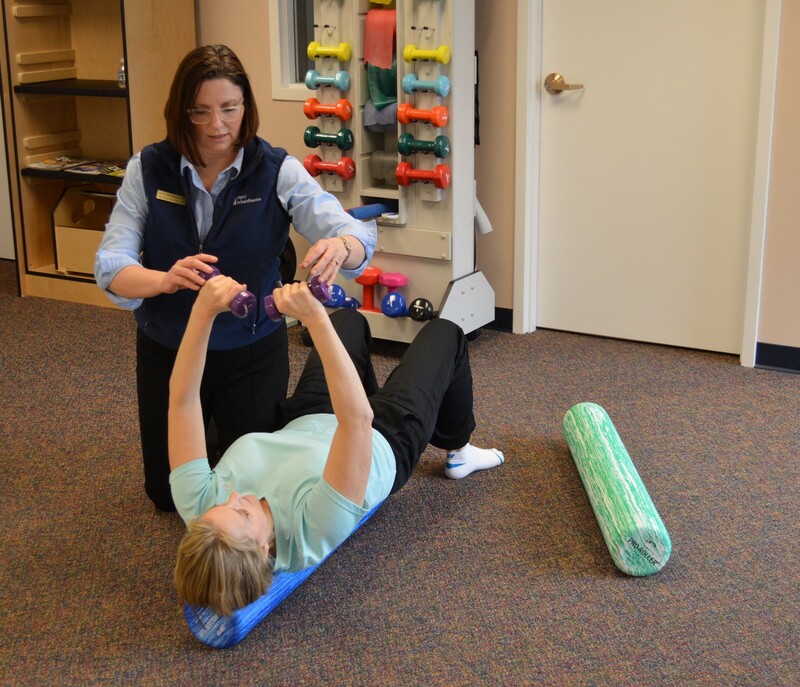 In fact, name a musculoskeletal ailment, and most likely, there’s a roller for that. My roller of choice Pro-Roller soft style, which runs $22.50 to $36. Since I am a bit of a wimp, I prefer this softer consistency which is more comfortable for me, particularly on my neck and back, since I have chronic soreness and stiffness in these areas. The soft compression of this roller works well on tight and rigid areas and is ideal for lying supine. In this position I use the roll almost in the way I would a weight bench, using light dumbbells to do chest flies; or I edge up to the top of the roll with my head off the end to do neck extensions. For these exercises I lie with the roll down the middle of my back, with the roll cushioning my spine. This is also a great position to do core exercises where I lift one arm off of the floor and raise the opposite leg and hold that pose while balancing to keep the role in place, underneath me. The truly terrific thing about using a foam roller for many varieties of therapy or fitness exercises is that they are easy to use, relatively inexpensive, easy to store — they can be hidden away under a bed or desk for instance, and you can conveniently pull one out several times a day without a lot of set up, to get in a little relief or relaxation when needed, even at work, if you have the space and privacy where you can lie down on a floor. If you are one of those people who likes to have someone walk on your back to crack it, rollers let you achieve this using your own weight against the roller, and if that is not enough pressure you can apply force as you roll. When I first began rolling, my back would crack like a fire; then, as I rolled more often, the cracking diminished, as my alignment improved. There are plenty of videos and articles online about roller exercises, though I would advise getting a baseline program from a professional physical therapist who can tell you if there’s any contraindications with your particular condition. My physical therapist provided me with an illustrated printout of base exercises which I have built upon, and already within six weeks I saw measurable improvements of 30 and 40 percent in my flexibility and range-of-motion in my problem areas. Clearly, I am on a roll.